Our hair doesn’t have it easy. Between styling with heated products, coloring it the latest shades or trying out highlights and lowlights, using heavy styling products and dealing with harsh weather, we can’t expect our locks to remain shiny and bouncy forever. They need a little help. Have you ever used botox for hair? It’s the newest hair treatment taking the salon industry by storm. The bad news is that it can be expensive and time consuming. The good news is that you can apply this treatment at home as well, even if you’re not a hair expert. 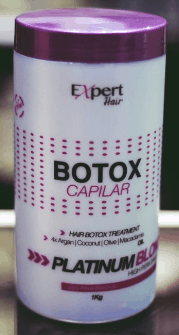 Check out my reviews of the following hair botox products to see which is best for you. Koko Keratin boasts that their product enhances hair with a hydrating boost while repairing and refining hair to make it fuller and healthier. I could not agree more. This botox brand was easy to use and came with detailed instructions that weren’t the least bit intimidating. If you’re looking for more of a straightening treatment, this probably isn’t for you, even though it does include keratin. But if you’re looking for healthy hair that shines like it never has before, give this brand a try. It was the first botox treatment that I tried and I really was impressed. Even though my first treatment made my hair much healthier, I was really looking for a botox treatment that completely transformed my hair. I gave Inoar Professional a try. I was impressed with the ingredients, which included proteins and glossing agents. When I mixed up my cream, I was hit with a heavenly vanilla scent that was unexpected but very welcomed. I’m normally very sensitive to scents but it wasn’t too heavy or irritating. The treatment eliminated just about all of my frizz after the first treatment. Even when the weather got a little humid a week later, my hair was still manageable and stunning. This treatment is a bit on the pricy side but it does contain some extras that make it worth it. It’s formaldehyde free but does contain caviar and collagen, making it even more effective at healing and plumping up your existing hair. This is a complete treatment kit and includes the botox treatment, replenishing shampoo, and a conditioner. 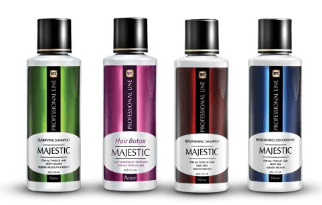 If your hair is in need of a complete reboot and not just a basic treatment, Majestic Hair Botox is the best investment you can make. I’ll warn you that there is a bit of a strong smell after using the shampoo but don’t let this deter you from completing the treatment. The smell doesn’t last and your hair will be left clean, soft and beautiful. I couldn’t believe the shine that Tahe Magic gave my hair. Even the texture changed. If you’re hoping to rejuvenate your curls, thicken fine and straight hair or breathe new life into dry hair, this product will do just what you need it to do. I will say that this treatment didn’t seem to last as long as the others but with the price as low as it is, working in an extra treatment or two a year is still a bargain. My hair can get pretty frizzy so if yours isn’t as bad, you might find your treatment lasting much longer than mine did. This is a unique treatment because instead of being a liquid, this product comes as a gel. It’s geared towards adding more shine and softness because the gel is able to deliver higher levels of protein to each hair fiber. Gel also lasts longer than liquid because you need less for each treatment. 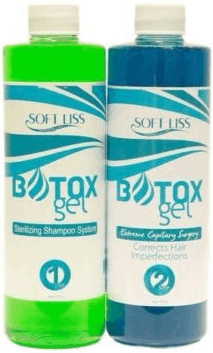 Depending on the length of your hair, a single bottle could last you up to 16 applications, making Soft Liss Botox Gel a bargain. I think that this product made my hair the shiniest out of all the botox hair products that I tried. Here’s a bit of a warning though. If you have very light colored hair, don’t be alarmed if the product seems to have made your hair a bit green. The color will rinse out when the treatment is over. This probably shouldn’t be the first botox hair treatment that you try but it will definitely be the last. Don’t let the price scare you because it lives up to its name. This is absolutely the expert version of botox hair treatments. 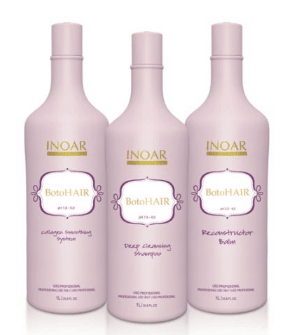 Help your hair recover after chemical damage while eliminating frizz and split ends, all with one simple treatment. What intrigued me most about this product when I was doing my botox hair research is that I couldn’t find a negative review on it. I have to agree. I have absolutely no complaints about Expert Hair Botox. It smells great, is easy to use and the results are fabulous and last. I don’t feel like I’m prepared unless I have this product in my medicine cabinet, just in case my hair begins to look dry and weathered. Botox is a drug that is medically used to treat muscular conditions. It is most commonly known for its use in the cosmetic industry where it is injected into the facial muscles in an effort to remove wrinkles. Botox and fillers can be awesome for your skin but it might surprise you to know that botox can be used for your hair as well. If you’re frustrated with your hair because it’s dry, damaged and frizzy, botox could be the solution that you’ve been looking for. Botox can work wonders for your hair. Take a look at these great benefits that you’re sure to love. Makes Hair More Manageable: Your hair will finally cooperate with you. No more struggling to get the exact style that you’re after. Makes Hair Soft and Shiny: Your hair will look and feel absolutely amazing. Breakage will be almost non-existent. Helps Split Ends: Get rid of split ends once and for all! Your hair will be stronger than ever. Stimulates Hair Growth: When your hair is healthy, it’s easier to grow. Just make sure that you don’t let the treatment touch your scalp. Use botox for hair while using Ultrax Labs Hair Surge for awesome hair growth results. You can expect these benefits to last up to six months. For the most part, botox is incredibly safe for improving hair health. The most common side effect is an increase in oil production from the scalp. This usually occurs when the botox is applied directly to the scalp instead of the hair, so it can be avoided with proper application techniques. As with most hair products, there is a risk for allergic reactions and irritation. If you happen to notice any redness, burning or irritation on your scalp, hairline or face, stop using botox for hair until you speak with a medical professional. The positives of using botox for hair growth and health definitely outweigh the negatives, as long as you use the product as intended and follow instructions. Both treatments will have your hair looking great in no time. A keratin treatment is more ideal as a straightening treatment with health hair benefits. Using botox for hair straightening isn’t out of the question but it’s more ideal for healing and improving the hair. Keratin treatments are great for anyone with thick and curly hair. Keratin will help to prevent frizzy hair and relax and loosen curls. Botox is great for just about any hair type. It’s also safe for very fine hair, which might not be the case with keratin treatments. Even if your hair is bleached or full of split ends, a botox treatment won’t have a negative effect. Instead, your hair should greatly improve. The most obvious difference between a keratin treatment and a botox treatment is the ingredients. Most keratin straightening treatments contain formaldehyde, which can have dangerous side effects. Hair botox does not contain formaldehyde. Hair botox also includes ingredients that work as a deep conditioning treatment. If your hair is extra damaged, a botox treatment might be more beneficial than a keratin treatment. Another bonus about botox hair treatments is that they are safe for pregnant and lactating women, which isn’t the case for keratin treatments. Once you have a basic idea of what you’re doing, applying a botox hair treatment is pretty easy. Hair botox products should contain everything you need. 1. Wash your hair using a clarifying shampoo. You want your hair to be as clean as possible. Rinse thoroughly and skip the conditioner. 2. Dry your hair briefly with a towel. Blow-dry your hair until it is almost dry but not completely. Detangle hair using a wide tooth brush. 3. Prepare the botox mixture by gathering the required amount of product and pouring it into a jar. Add the necessary amount of warm water, depending on the specific brand’s instructions. Mix with a brush until a creamy texture forms. 4. Part your hair into four or more sections, depending on how thick it is. Apply the botox cream with a brush,¼ inch from the root. Be careful not to oversaturate. Comb solution throughout hair, making sure that the botox cream is distributed evenly. Each strand should be completely coated. 5. Let the botox cream sit for about 45 minutes (longer for curly hair). Put on a shower cap and blow-dry hair on the highest setting for 15 minutes. This will really help the botox penetrate the hair. 6. Rinse away a bit more than half of the treatment. Leave the remaining in your hair. 7. Blow-dry hair again, brushing it as you go. Use a titanium flat iron to them seal in the treatment. Set the temperature to 410°F-450°F and straighten hair. If your hair is bleached or fine, you might want to reduce the heat. According to botox for hair reviews, botox treatments can be applied every month or two, depending on your hair type. Botox is a great and more natural treatment that you can use to remoisturize and improve your hair. While everyone will respond a bit differently to a hair botox treatment, let me share my individual experience with you in an attempt to explain what you can expect after your treatment. My interest in hair botox started after I saw a few pictures of myself from a wedding that I attended. I had bought a gorgeous dress, my recent workouts had been paying off and my friend had applied my makeup (it’s what she does for a living) so needless to say, I really felt confident that evening. Until I saw the pictures, that is. My hair looked lifeless. Even though I had spent over an hour curling it and putting it in a fancy updo, it looked absolutely awful. It looked dry and damaged. I was so embarrassed. After all the effort I put into looking my best that night, my hair had been the star of the show and not in a good way. When my research for hair health led me to botox, I couldn’t wait to give it a try. After my first treatment, I was blown away. My hair felt so silky soft. I loved running my fingers through it. It was also very manageable. I never struggled with tough tangles. Instead, I was able to style my hair with ease. Now when I see pictures of my hair, it looks shiny and healthy. I’m so happy that I found hair botox. It’s made such a difference in my self-confidence. If you’re tired of fighting with your hair, give botox a try. Whether you’re using botox for hair loss or are looking for a more natural way to strengthen your hair, you’re sure to love the results.